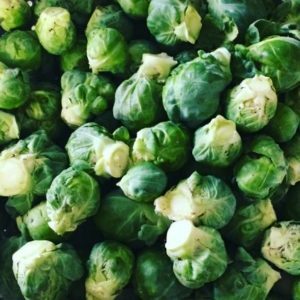 October 11, 2017 0 comments on "How to Freeze Brussel Sprouts"
This is my second year trying to grow brussel sprouts. I didn’t get as many as I would have liked, but we still got enough so that we could enjoy some fresh and then freeze some for winter. If you aren’t growing brussel sprouts but you do find a good deal on some at the grocery store or farmer’s market, you can still use these easy tips to freeze them for winter. After all, you can only eat so many brussel sprouts at one time! If your brussel sprouts are still on the stalk, then you first need to use a sharp knife to cut them off of the stalk. After you are done removing them give them a good rinse. I placed them in a colander like this one . While you are rinsing them, look them over really well, removing any bad looking leaves. Next you are going to blanch the brussel sprouts before freezing them. It is important to blanch them to stop the spoiling process. When you freeze them without blanching them, there are natural enzymes that cause vegetables to lose their natural color and flavor, so you want to stop that process by blanching them. Fill a stock pot about half full with water, and bring the water to a boil. When the water is boiling, place the rinsed brussel sprouts into the boiling water and boil for 4 minutes. Pour the brussel sprouts back into the colander and pour some ice cubes on top of them so that they will cool off quickily. After you are done cooling the brussel sprouts, pat them dry with a dish towel or paper towel and lay them in a single layer on a cookie sheet. Place the cookie sheet in the freezer until the brussel sprouts are frozen, a couple of hours. When the brussel sprouts are frozen, remove them from the freezer and transfer them to ziploc freezer bags. The great thing about freezing them on the cookie sheet first is that you are freezing the brussel sprouts individually. Now when you transfer them to the freezer bag they won’t stick together and you can remove however many you need at one time. Place the ziploc freezer bags into the freezer. For best quality, brussel sprouts can be stored in the freezer for about 6 months.